A sourdough bakery and cafe serving excellent breakfast and lunch options. East Dulwich is becoming Sourdough Central. A branch of the trendy sourdough pizzeria Franco Manca opened over the summer and just off the main high street is this bakery and café in an old electrical warehouse. Though not the only independent bakery in East Dulwich, Brick House is the first to specialise in the slow-fermented breads beloved by hipsters (and most other people, too). 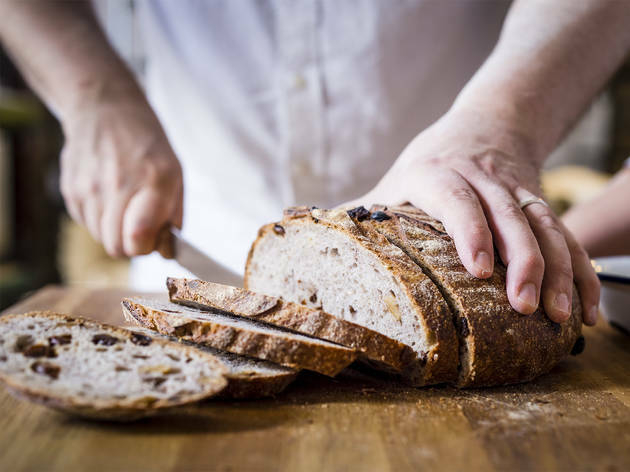 Brick House first operated as a bakery in Peckham Rye in 2012, selling loaves of white, rye and raisin and walnut. Here you can also eat in, but the bread is still the main attraction – soft crumb, crunchy crust, very light and full of flavour. Breakfast is simple: we had nicely ripe avocado slathered on rye (£3.50) and fried eggs, well-cooked ham, garlicky greens and lots of toast (£4). There’s also granola, toast and Nutella on toast. It comes with a smile from well informed and bread-passionate staff. Brick House fits in nicely with other nearby independent food offerings such as veg shop Franklins and William Rose Butchers, but is definitely trendier than most of the bakeries. That’s a difference clearly embraced by the locals who fill its spaciously placed tables throughout the day. The mixed, laid-back crowd include mums and babies (the cement floors are easy to clean) as well as young professionals making use of free wifi. Pastries are also worth checking out, especially the exceptionally fresh morning bun (£3.50). Lunch is sandwiches and soup and there are nice touches for kids – milk and cookies, boiled egg and soldiers. It may be sourdough, but you won’t leave Brick House sour-faced. Or having spent very much dough. Brick House is a sourdough bakery and café based in East Dulwich, south-east London, run by husband and wife team Fergus and Sharmin Jackson. The coffee and pastries are superb and if you see the pork breakfast bun on the menu, even if you've already eaten breakfast, order it. You won't regret it. The staff can't do more for you and the cafe is filled with a mixture of east dulwich families (very child friendly), young couples and individuals with their heads down in a laptop or tablet making use of the free wifi. Hey their early at the weekend or get a takeaway. Goes without saying that the sourdough bread sold for takeaway is as good as you can find in London. It is definitely worth queuing up here on a Sunday morning for a loaf of sourdough bread. I come here every weekend to get my fix. Still waiting to try their famous chocolate bread - I've only heard good things so I can't wait. Great place for a coffee and sourdough bread (Peckam Rye is my favourite). Very friendly staff and lots of seats, with communal and individual tables. They serve brilliant fried egg, bacon and greens on toasted bread with butter. You will also find a yummy marmalade on each table. The green bean salad is also delicious, but the coffee and walnut cake wasn’t that great. The kitchen I open, so you can see chefs at work. 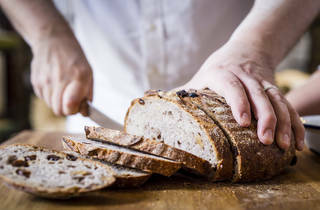 If you want to learn how to make some of your favourite breads, you can join their baking classes. Best bread and morning buns by a clear mile! Great coffee to go with great bread. Get the flat white just right. This is no half-assed operation! Tastiest Bread I had in a while and I am addicted to the morning buns! We made the journey down to Brick House after a day on the Shaun the Sheep trail having travelled up from Bristol...it was the perfect relaxed atmosphericplace for a rest, a nice brew and some fantastic cakes to revive us before we headed home Westward! London's finest bread now available with booze. Whats not to love? Best bread. Best bakery. I traveled from Cheltenham to try there bread!! Did not disappoint. Fantastic. Friendly, spacious bakery and cafe. Delcious fresh bread. Love it. Love this place! The bread is to die for and the small but perfectly formed food menu is delicious, the staff are all utterly lovely and the cafe overall has a really welcoming vibe. I’ve always loved FM, I’m one of those people that ran around telling everyone it was “Londons best pizza” for years after eating in the Brixton Village store the first time…. I’m also the kind of snob that worries when a little operation starts to grow real fast, and I’m sad to say in this instance the fear was justified. The Dulwich restaurant is a bit less friendly- the staff rushed us through decisions and cleared half the table while people were still eating- bit of a pet peeve. The Pizza was tasty but stretched thinner than the original FM. The price is right and its still tasty but its beginning to feel a little diluted- sorry!